This tutorial will show you how to acquire and install an SSL certificate from a trusted, commercial Certificate Authority (CA). SSL certificates allow web servers to encrypt their traffic, and also offer a mechanism to validate server identities to their visitors. The main benefit of using a purchased SSL certificate from a trusted CA, over self-signed certificates, is that your site’s visitors will not be presented with a scary warning about not being able to verify your site’s identity. You may also use any other CA of your choice. After you have acquired your SSL certificate, we will show you how to install it on Nginx and Apache HTTP web servers. There are several prerequisites that you should ensure before attempting to obtain an SSL certificate from a commercial CA. This section will cover what you will need in order to be issued an SSL certificate from most CAs. SSL certificates that are issued from commercial CAs have to be purchased. The best free alternative are certificates issued from Let’s Encrypt. Let’s Encrypt is a new certificate authority that issues free SSL/TLS certificates that are trusted in most web browsers. Before acquiring an SSL certificate, you must own or control the registered domain name that you wish to use the certificate with. If you do not already have a registered domain name, you may register one with one of the many domain name registrars out there (e.g. Namecheap, GoDaddy, etc.). For the basic domain validation process, you must have access to one of the email addresses on your domain’s WHOIS record or to an “admin type” email address at the domain itself. Certificate authorities that issue SSL certificates will typically validate domain control by sending a validation email to one of the addresses on the domain’s WHOIS record, or to a generic admin email address at the domain itself. Some CAs provide alternative domain validation methods, such as DNS- or HTTP-based validation, which are outside the scope of this guide. If you wish to be issued an Organization Validation (OV) or Extended Validation (EV) SSL certificate, you will also be required to provide the CA with paperwork to establish the legal identity of the website’s owner, among other things. If you are not sure of which Certificate Authority you are going to use, there are a few important factors to consider. At an overview level, the most important thing is that the CA you choose provides the features you want at a price that you are comfortable with. 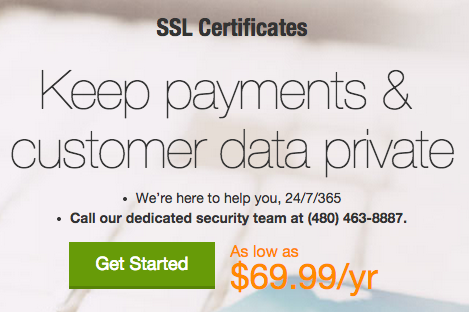 This section will focus more on the features that most SSL certificate buyers should be aware of, rather than prices. The most crucial point is that the CA that you choose is a member of the root certificate programs of the most commonly used operating systems and web browsers, i.e. it is a “trusted” CA, and its root certificate is trusted by common browsers and other software. If your website’s SSL certificate is signed by a trusted” CA, its identity is considered to be valid by software that trusts the CA–this is in contrast to self-signed SSL certificates, which also provide encryption capabilities but are accompanied by identity validation warnings that are off-putting to most website visitors. Most commercial CAs that you will encounter will be members of the common root CA programs, and will say they are compatible with 99% of browsers, but it does not hurt to check before making your certificate purchase. For example, Apple provides its list of trusted SSL root certificates for iOS8 here. This guide will show you how to obtain a single domain or wildcard SSL certificate from GoDaddy and RapidSSL, but obtaining the other types of certificates is very similar. After you have all of your prerequisites sorted out, and you know the type of certificate you want to get, it’s time to generate a certificate signing request (CSR) and private key. At this point, you will be prompted for several lines of information that will be included in your certificate request. The most important part is the Common Name field which should match the name that you want to use your certificate with–for example, example.com, www.example.com, or (for a wildcard certificate request) *.example.com. If you are planning on getting an OV or EV certificate, ensure that all of the other fields accurately reflect your organization or business details. This will generate a .key and .csr file. The .key file is your private key, and should be kept secure. The.csr file is what you will send to the CA to request your SSL certificate. Now we are ready to buy a certificate from a CA. We will show two examples, GoDaddy and RapidSSL via Namecheap, but feel free to get a certificate from any other vendor. 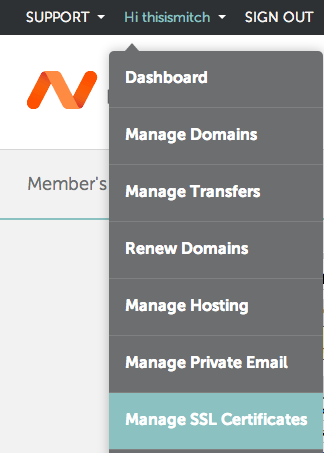 Namecheap provides a way to buy SSL certificates from a variety of CAs. We will walk through the process of acquiring a single domain certificate from RapidSSL, but you can deviate if you want a different type of certificate. Note: If you request a single domain certificate from RapidSSL for the www subdomain of your domain (e.g.www.example.com), they will issue the certificate with a SAN of your base domain. For example, if your certificate request is for www.example.com, the resulting certificate will work for both www.example.comand example.com. Go to Namecheap’s SSL certificate page: https://www.namecheap.com/security/ssl-certificates.aspx. 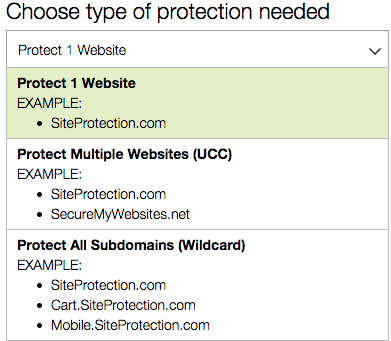 Here you can start selecting your validation level, certificate type (“Domains Secured”), or CA (“Brand”). For our example, we will click on the Compare Products button in the “Domain Validation” box. Then we will find “RapidSSL”, and click the Add to Cart button. At this point, you must register or log in to Namecheap. Then finish the payment process. After paying for the certificate of your choice, go to the Manage SSL Certificates link, under the “HiUsername” section. Here, you will see a list of all of the SSL certificates that you have purchased through Namecheap. Click on the Activate Now link for the certificate that you want to use. Now select the software of your web server. This will determine the format of the certificate that Namecheap will deliver to you. Commonly selected options are “Apache + MOD SSL”, “nginx”, or “Tomcat”. Paste your CSR into the box then click the Next button. You should now be at the “Select Approver” step in the process, which will send a validation request email to an address in your domain’s WHOIS record or to an administrator type address of the domain that you are getting a certificate for. Select the address that you want to send the validation email to. Provide the “Administrative Contact Information”. Click the Submit order button. At this point, an email will be sent to the “approver” address. Open the email and approve the certificate request. After approving the certificate, the certificate will be emailed to the Technical Contact. The certificate issued for your domain and the CA’s intermediate certificate will be at the bottom of the email. Copy and save them to your server in the same location that you generated your private key and CSR. Name the certificate with the domain name and a .crt extension, e.g. example.com.crt, and name the intermediate certificate intermediate.crt. The certificate is now ready to be installed on your web server. GoDaddy is a popular CA, and has all of the basic certificate types. We will walk through the process of acquiring a single domain certificate, but you can deviate if you want a different type of certificate. Go to GoDaddy’s SSL certificate page: https://www.godaddy.com/ssl/ssl-certificates.aspx. Scroll down and click on the Get Started button. Select the type of SSL certificate that you want from the drop down menu: single domain, multidomain (UCC), or wildcard. Then select your plan type: domain, organization, or extended validation. Then select the term (duration of validity). Review your current order, then click the Proceed to Checkout button. Complete the registration and payment process. After you complete your order, click the SSL Certificates* button (or click on My Account > Manage SSL Certificates in the top-right corner). Find the SSL certificate that you just purchased and click the Set Up button. If you have not used GoDaddy for SSL certificates before, you will be prompted to set up the “SSL Certificates” product, and associate your recent certificate order with the product (Click the green Set Up button and wait a few minutes before refreshing your browser). After the “SSL Certificates” Product is added to your GoDaddy account, you should see your “New Certificate” and a “Launch” button. Click on the Launch button next to your new certificate. Provide your CSR by pasting it into the box. The SHA-2 algorithm will be used by default. Tick the I agree checkbox, and click the Request Certificate button. Now you will have to verify that you have control of the domain, and provide GoDaddy with a few documents. GoDaddy will send a domain ownership verification email to the address that is on your domain’s WHOIS record. Follow the directions in the emails that you are sent to you, and authorize the issuance of the certificate. After verifying to GoDaddy that you control the domain, check your email (the one that you registered with GoDaddy with) for a message that says that your SSL certificate has been issued. Open it, and follow the download certificate link (or click the Launch button next to your SSL certificate in the GoDaddy control panel). Now click the Download button. Select the server software that you are using from the Server type dropdown menu–if you are using Apache HTTP or Nginx, select “Apache”–then click the Download Zip File button. Extract the ZIP archive. It should contain two .crt files; your SSL certificate (which should have a random name) and the GoDaddy intermediate certificate bundle (gd_bundle-g2-1.crt). Copy both two your web server. Rename the certificate to the domain name with a .crt extension, e.g. example.com.crt, and rename the intermediate certificate bundle as intermediate.crt. After acquiring your certificate from the CA of your choice, you must install it on your web server. This involves adding a few SSL-related lines to your web server software configuration. We will cover basic Nginx and Apache HTTP configurations on Ubuntu 14.04 in this section. Note: In a real environment, these files should be stored somewhere that only the user that runs the web server master process (usually root) can access. The private key should be kept secure. If you want to use your certificate with Nginx on Ubuntu 14.04, follow this section. With Nginx, if your CA included an intermediate certificate, you must create a single “chained” certificate file that contains your certificate and the CA’s intermediate certificates. Now restart Nginx to load the new configuration and enable TLS/SSL over HTTPS! Test it out by accessing your site via HTTPS, e.g. https://example.com. If want to use your certificate with Apache on Ubuntu 14.04, follow this section. Now restart Apache to load the new configuration and enable TLS/SSL over HTTPS! Test it out by accessing your site via HTTPS, e.g. https://example.com. You will also want to try connecting via HTTP, e.g. http://example.com to ensure that the redirect is working properly! Now you should have a good idea of how to add a trusted SSL certificate to secure your web server. Be sure to shop around for a CA that you are happy with! In this guide, we’ll cover how to create a self-signed SSL certificate for Apache on an Ubuntu 14.04 server, which will allow you to encrypt traffic to your server. While this does not provide the benefit of third party validation of your server’s identity, it fulfills the requirements of those simply wanting to transfer information securely. Before you begin, you should have some configuration already taken care of. We will be operating as a non-root user with sudo privileges in this guide. You can set one up by following steps 1-4 in our Ubuntu 14.04 initial server setup guide. 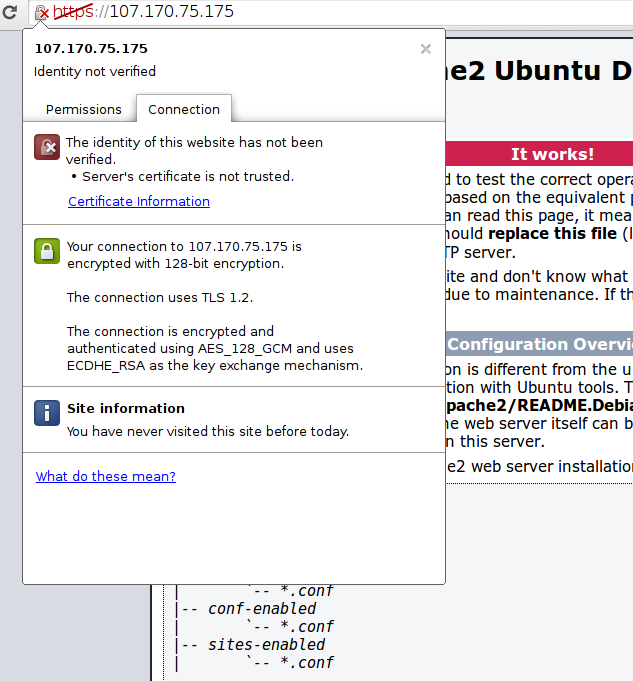 SSL support actually comes standard in the Ubuntu 14.04 Apache package. We simply need to enable it to take advantage of SSL on our system. With that, our web server is now able to handle SSL if we configure it to do so. Let’s go over exactly what this means. When you hit “ENTER”, you will be asked a number of questions. The most important item that is requested is the line that reads “Common Name (e.g. server FQDN or YOUR name)”. You should enter the domain name you want to associate with the certificate, or the server’s public IP address if you do not have a domain name. The key and certificate will be created and placed in your /etc/apache2/ssl directory. Now that we have our certificate and key available, we can configure Apache to use these files in a virtual host file. You can learn more about how to set up Apache virtual hosts here. Instead of basing our configuration file off of the 000-default.conf file in the sites-availablesubdirectory, we’re going to base this configuration on the default-ssl.conf file that contains some default SSL configuration. This may look a bit complicated, but luckily, we don’t need to worry about most of the options here. We want to set the normal things we’d configure for a virtual host (ServerAdmin, ServerName, ServerAlias, DocumentRoot, etc.) as well as change the location where Apache looks for the SSL certificate and key. Save and exit the file when you are finished. Now that we have configured our SSL-enabled virtual host, we need to enable it. This should enable your new virtual host, which will serve encrypted content using the SSL certificate you created. This is expected since we have self-signed our certificate. While our certificate will not validate our server for our users because it has had no interaction with a trusted certificate authority, it will still be able to encrypt communication. Since this is expected, you can hit the “Proceed anyway” button or whatever similar option you have in your browser. You can see in the middle green section that the connection is encrypted. You should now have SSL enabled on your website. This will help to secure communication between visitors and your site, but it will warn each user that the browser cannot verify the validity of the certificate. If you are planning on launching a public site and need SSL, you will be better off purchasing an SSL certificate from a trusted certificate authority. If you want to learn more about how to configure Apache, click here. Check out this link for more ideas on how to secure your Linux server. This article will show how to create a simple firewall on a Centos VPS. It will only open up ports that we want and close up other services. I will also show how to prevent simpler attacks, and how to let yourself back in to the VPS if you deny access to yourself by accident. The tutorial is not by any means exhaustive and only shows how to open up a few incoming ports: for apache, SSH and email and close all the others. We will not be blocking any outgoing traffic, and only create a few most common rules to block the usual scripts and bots that look for vulnerable VPS. iptables is a simple firewall installed on most linux distributions. The linux manual page for iptables says it is an administration tool for IPv4 packet filtering and NAT, which, in translation, means it is a tool to filter out and block Internet traffic. 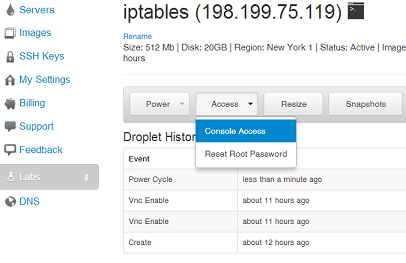 iptables firewall is included by default in Centos 6.4 linux images provided by DigitalOcean. We will set up firewall one by one rule. To simplify: a firewall is a list of rules, so when an incomming connection is open, if it matches any of the rules, this rule can accept that connection or reject it. If no rules are met, we use the default rule. Note: This tutorial covers IPv4 security. In Linux, IPv6 security is maintained separately from IPv4. For example, “iptables” only maintains firewall rules for IPv4 addresses but it has an IPv6 counterpart called “ip6tables”, which can be used to maintain firewall rules for IPv6 network addresses. To start with, we want to know what services we want to open to public. Let’s use the typical web-hosting server: it is a web and email server, and we also need to let ourselves in by SSH server. First, we want to leave SSH port open so we can connect to the VPS remotely: that is port 22. Also, we need port 80 and 443 (SSL port) for web traffic. For sending email, we will open port 25 (regular SMTP) and 465 (secure SMTP). To let users receive email, we will open the usual port 110 (POP3) and 995 (secure POP3 port). Additionally, we’ll open IMAP ports, if we have it installed: 143 for IMAP, and 993 for IMAP over SSL.Note: It is recommended to only allow secure protocols, but that may not be an option, if we cannot influence the mail service users to change their email clients. We can then add a few simple firewall rules to block the most common attacks, to protect our VPS from script-kiddies. We can’t really count on iptables alone to protect us from a full-scale DDOS or similar, but we can at least put off the usual network scanning bots that will eventually find our VPS and start looking for security holes to exploit. First, we start with blocking null packets. We told the firewall to take all incoming packets with tcp flags NONE and just DROP them. Null packetsare, simply said, recon packets. The attack patterns use these to try and see how we configured the VPS and find out weaknesses. The next pattern to reject is a syn-flood attack. Syn-flood attack means that the attackers open a new connection, but do not state what they want (ie. SYN, ACK, whatever). They just want to take up our servers’ resources. We won’t accept such packages. Now we move on to one more common pattern: XMAS packets, also a recon packet. We have ruled out at least some of the usual patterns that find vulnerabilities in our VPS. We tell iptables to add (-A) a rule to the incoming (INPUT) filter table any trafic that comes to localhost interface (-i lo) and to accept (-j ACCEPT) it. Localhost is often used for, ie. your website or email server communicating with a database locally installed. That way our VPS can use the database, but the database is closed to exploits from the internet. We now told iptables to add a rule for accepting tcp traffic incomming to port 22 (the default SSH port). It is advised to change the SSH configuration to a different port, and this firewall filter should be changed accordingly, but configuring SSH is not a part of this article. However, we could do one more thing about that with firewall itself. If our office has a permanent IP address, we could only allow connections to SSH from this source. This would allow only people from our location to connect. in the terminal, we should see us logged in (if we’re the only one logged in’ and our IP address written down. Replace YOUR_IP_ADDRESS with the actuall IP, of course. It will allow any established outgoing connections to receive replies from the VPS on the other side of that connection. When we have it all set up, we will block everything else, and allow all outgoing connections. Now we have our firewall rules in place. Now that we have all the configuration in, we can list the rules to see if anything is missing. The saved rules will persist even when the VPS is rebooted. This will flush the filters, we’ll be able to get in the VPS again. This article is not exhaustive, and it only scratched the surface of running a simple firewall on a linux machine. It will do enough for a typical web and email server scenario for a developer not familiar with linux command line or iptables. However, a lot more could be done. There are good tutorials and samples on the internet to help us provide more robust configuration. For production environments, it would be advised to create a more detailed configuration or to have a security expert prepare the configuration. Hopefully, the short instructions will provide basic security to new VPSs.